BlackBerry has launched its KEYone smartphone in India. It features a 4.5-inch (1620 x 1080 pixels) display with 3:2 aspect ratio and has a 4-row QWERTY physical backlit keyboard with keys that respond to touch gestures, support for flick typing, up to 52 customizable shortcuts and the fingerprint sensor is built into the spacebar. It has an anodized aluminum frame and a soft touch textured back. It is powered by an Octa-Core Snapdragon 625 processor with 3GB RAM and 32GB internal storage which is further expandable with MicroSD Card. It runs on Android 7.1 (Nougat) with security and productivity suite from BlackBerry. On Camera, It has a 12MP rear camera with dual-tone LED Flash, Sony IMX378 sensor, and 8MP front-facing camera. Connectivity options include 4G LTE, Wi-Fi 802.11 ac (2.4 & 5 GHz), Bluetooth 4.2, GPS / GLONASS, NFC, USB 3.1 Type-C Packed with a 3505mAh battery with Qualcomm Quick Charge 3.0 that charge up to 50% in just 36 minutes. 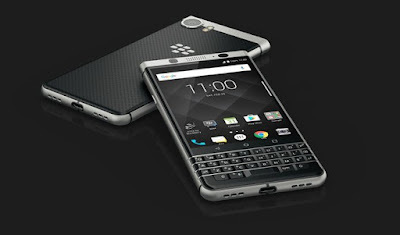 BlackBerry KEYone comes in Limited Edition Black color in India, is priced at Rs. 39,990 and will be available exclusively from Amazon.in starting from August 8th.